Capn Mike is one of the newest Cutthroats and a long term veteran with a past rival squadron in Air Warrior - A.C.C.S (Aerial Crowd Control Services). Fortunately, the ACCS ran out of sheep and declared bankruptcy. This real life airline captain shows far less mercy to his enemies than to his paying customers. Flying one of the most advanced airliners in the world today, Capn Mike hones his flying skills for the aerial battleground that is Aces High. He is typically one of the top three killers in the Cutthroats and possesses a wide variety of skills in fighters, attackers, bombers and vehicles. His leadership skills and mastery of formation flying were noticed by the Cutthroats' top brass, who made the decision to double his salary. Lacking sufficient funds (and rum), command of Redbeard flight was awarded. Capn Mike inherits this position from some of the great Cutthroat Pie-lets, among them the great MOMO, 3fingers ($mar), and Orion. He's got big shoes to fill. Good thing he has big feet. Quotes: "What's an attitude indicator?" "I get PAID to fly!" Bragging rights: Saved a burning aircraft, its crew and passengers on takeoff with no more damage than a lost engine (in real life!). An experienced air warrior who is a real-life private pilot of 10 years with 16 years of flight sim experience (including full size sims with AST [AST-300] and Flight Safety/Boeing [747-400, 767-400, 777-200]). He's currently flying WINFC T-34B's out of Whidbey Island Naval Air Station. MiG has had the great fortune of experiencing a carrier trap and catapult launch aboard the USS Enterprise as a VIP in a COD (C-2A). He's honed his air-to-air fighting skills with and against Boa and Lemur as an Air Combat USA alumnist through their advanced air combat courses. 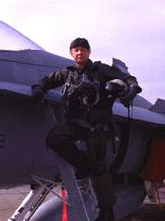 MiG was brought into the squadron as a "ringer" after developing a reputation as a killer pilot in the AOL Air Warrior arenas. He quickly established a rapport with co-Bluebeard member and wingman Dice. As the squad expanded into an Air Wing, he and flight leader Dice created the new Graybeard flight. Ascending to command Grey flight, MiG honed his leadership skills and was soon nominated to the position of squadron X.O. under C.O. Colonel Lemur When Lemur retired his command, MiG accepted the position as Commanding Officer of the Cutthroats. Most of the photos now seen on the CMC webpage are Mig Eater's originals. Wow! Quote: "No problems here, I have 40 of 'em surrounded." Favourite Aircraft: " Any airplane with one engine and guns"
LtCol in Air Combat USA Squadron after completing basic through advanced air combat training with a total of 18 actual ACM engagements. Held 1st place on AOL FR Ladder for several weeks and finished second in the final showdown. Commanding Officer, alternating on American and Japanese sides in the last Air Warrior Pearl Harbor Scenerio. testament to his abilities. Truly one of the most impressive fighters in the game of Aces High. Awulf makes his return to active duty in Aces High by joining Redbeard Flight. A one-time Flight Lead for Crimson flight, Awulf brings a world of experience from Air Warrior to the skies of AH. He's never one to shy away from an opportunity to add to his kill score, often taking many bandits on at one time. Rarely do they all survive. Awulf also has that rare gift for recounting great tales of Cutthroats honor and glory in battle. His after-action reports put you back into the action with vivid detail and eloquent writing style.